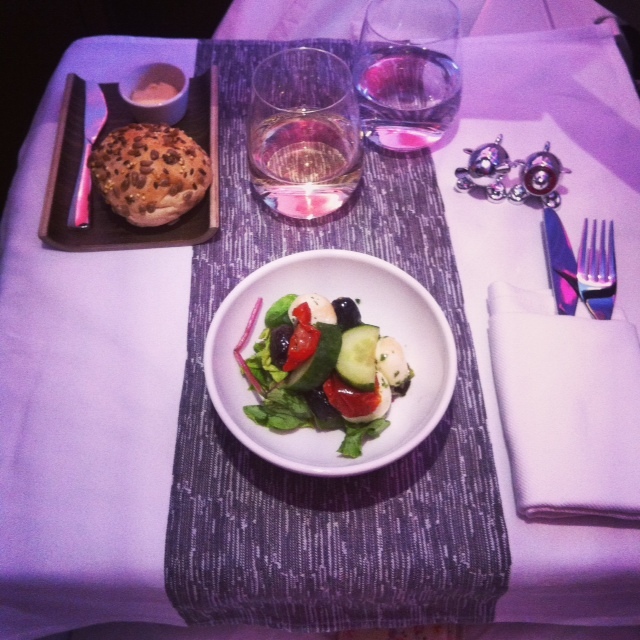 Flying First Class with Virgin starts long before you step on the plane. From the moment you check in, you’re wrapped up into a world of luxury and exceptional service. After checking in at the Premium Economy & First Class check in bays, our tickets were given an extra silver ‘premium’ ticket, which granted us access to a private VIP route through security, saving us loads of time. 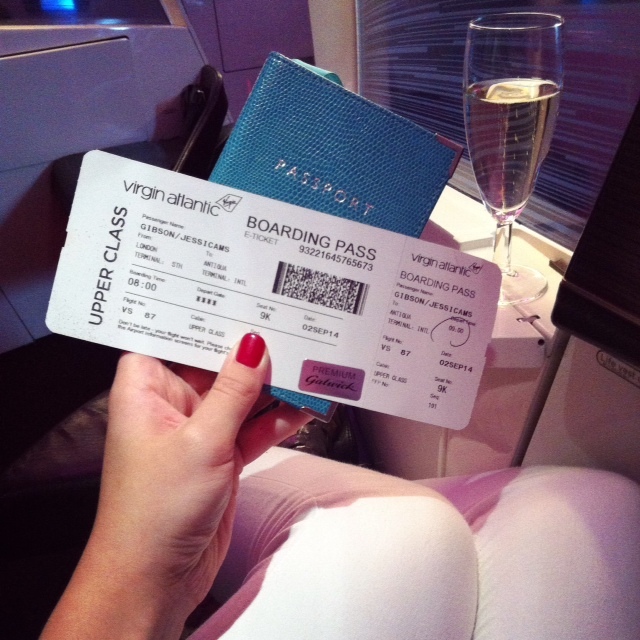 Once through security, the VIP experience continues in the Virgin Atlantic Club House. Complimentary breakfasts, coffees and refreshments were on offer, but as we were tight for time we only had a few minutes to pop our heads in and check it out. From the moment I stepped on board, the First Class service was a whole different ball game to Economy, or even Business. I was welcomed by the cabin crew, shown to my seat and introduced to my personally-assigned air host Ben, who was to look after me for the entire flight. Ben gave me a ‘tour’ of my pod, explaining exactly how the seat and entertainment centre worked, before offering me a glass of champagne (at 8.45am no less!) Did I oblige? Of course I did. There was a bar in First Class serving unlimited cocktails, champagne and spirits upon request, but I actually stuck to water and peppermint tea for the majority of the flight. I also found a wash bag on my seat complete with toothbrush, toothpaste, eye mask, ear plugs and bed socks. Everything had been thought of and everything was covered. 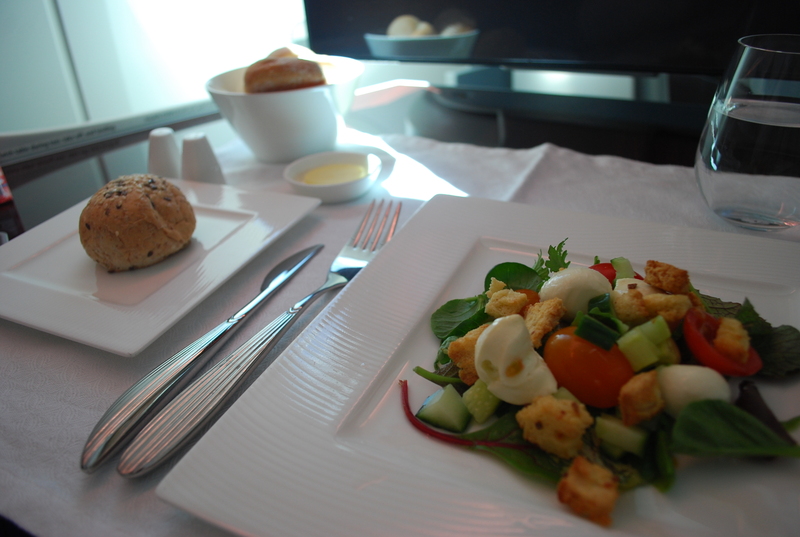 One thing I couldn’t wait to try once on board was the food. Almost immediately after sitting down, my host Ben gave me the First Class menu to peruse, including a 3 course lunch, afternoon tea, drinks and cocktails. The foodie highlight was lunch; when they laid down the white table cloth and polished cutlery, I knew it was going to be good. With options such as Crayfish and Avocado on Melba Toast, Chicken Katsu Curry and Fillet of Beef, it was a menu fit for one of London’s top restaurants. There were 3 options for each course, as well as a ‘Mad Hatters Afternoon Tea’ menu, a playful twist on the classic afternoon tea which embodied the whimsical side of the Virgin brand perfectly. I opted for a Mozerella and Tomato Salad with Pesto Dressing, Spinach and Ricotta Ravioli with Sweet Potato and Sticky Toffee Pudding. Each course was delicious and perfectly accompanied by a (real) glass of Chablis and still or sparkling water. I was in my element. My table setting came with a warm bread roll, salt and pepper and a glass of sparkling water. 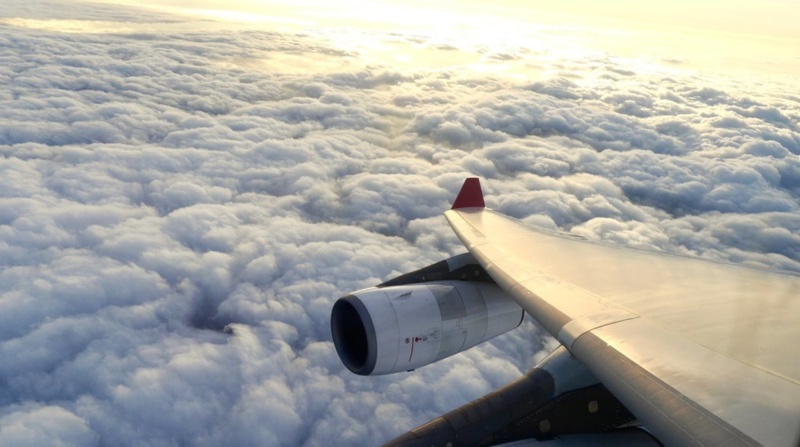 I’ve never understood why pilots tell you to ‘sit back, relax and enjoy the flight’ – until now. My seat reclined so far back I was almost horizontal, and that was before transforming the chair into the completely flat bed. A 3 course meal, 2 glasses of wine and The Wolf of Wall Street later, I was ready to convert my seat into a flat bed. The seat retracts in to make a flat mattress, big enough to stretch out completely on – perfect. I can normally never sleep on planes, so was interested to see if the flat bed and extra space would make a difference, and boy it did. The bed is quite firm and not like a sprung mattress, but with the luxurious cotton sheets, down-like pillows , ear plugs and eye mask, I had a deep sleep and was totally undisturbed for about 2 hours. 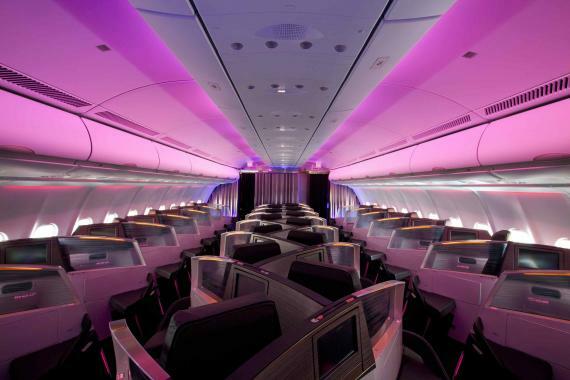 Flying First Class with Virgin Atlantic was the ultimate luxury travel experience. The service was flawless from start to finish and I actually enjoyed every minute of my 8 hour flight to Antigua. Being in such comfortable surroundings meant that the 8 hours literally flew by and I stepped off the plain feeling refreshed and energised instead of groggy and achy (my standard symptoms following an Economy long-haul flight). Flying First Class is a huge privilege, but if you ever have the chance or are thinking of splashing out for a really special upcoming trip, I highly recommend you do it. And do it with Virgin. Oh wow looks absolutely amazing! When you checked in were they aware that you were on a press trip/you have a travel blog? Or was this a lucky encounter? Hi Stephen, thanks for your comment! I was actually upgraded as I was on a media press ticket so I think they were hoping I would write nice things! Oh wow, that looks amazing! Wow- it sounds amazing! 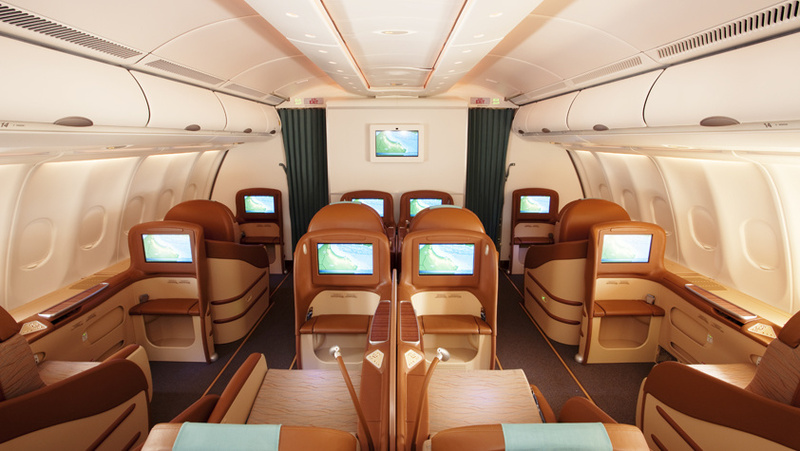 Would love to travel first class one day! That looks amazing! Especially the foodie bits! One day…..one day! Maybe. Sounds fantastic! I’ve only flown first class on American Airlines, usually their LA to London flight but this looks so much nicer! I especially like the idea of afternoon tea on board. So fun. Thanks for sharing! Not too shabby at all, I’m still reeling from the fact you get an actual glass (ha). Having an actual bed would be the other big luxury as well. Looks like you’re having a fantastic time and seeing your social media updates isn’t half making me want to book the next (economy for me) flight there!